San Francisco - A federal district court here has granted conservationists' request for a halt to a logging project that would cut thousands of very large dead trees (called snags)from a burn area which includes critical habitat for the northern spotted owl and is part of an old-growth forest reserve on the Six Rivers National Forest in northern California. The U.S. Forest Service used a Bush Administration rule change, part of its so-called Healthy Forests Initiative, to shield the logging from public challenge. The groups challenging the Sims Fire Salvage Timber Sale say the project is destructive in its own right, and would set a dangerous precedent allowing logging in old-growth forest reserves and protected species' critical habitat without review of the impacts. Conservationists charge that the Forest Service used the controversial exemption to rush through post-fire salvage logging while ignoring scientific evidence that the logging is likely to harm the recovery of old-growth forests and northern spotted owls in the area. They point to studies which show threatened species continue using even severely burned areas like that proposed for logging. Today, federal judge Susan Illston agreed that the project would cause irreparable harm to the environment and granted a preliminary injunction until she can fully examine the case on its merits. In her decision granting the preliminary injunction, Judge Susan Illston found that "there is no evidence in the record that defendant ever considered whether the northern spotted owl benefits from a severely burned forest habitat." Even more compelling, the court wrote, were several lines of evidence that the Forest Service was ignoring its own requirements that snags be retained until they could be replaced in a regrown forest. Holding that the conservation plaintiffs showed "a substantial likelihood of success on the merits" on these points, Judge Illston wrote that "(t)he Court refuses to brush these arguments aside in a conclusory manner simply because defendant wishes to begin logging immediately." The Sims Fire Salvage timber sale would cut an estimated 6.1 million board feet from only 169 acres, an average of more than 36,000 board feet per acre, clear evidence that the Forest Service is cutting an old-growth forest. The average tree to be cut is nearly three feet in diameter, and a great many are much larger. The Six Rivers National Forest has designated Sierra Pacific Industries the high bidder for the Sims fire sale, but has not yet awarded a contract to the company, which is the largest landowner in California. Of the 169 acres that would be cut, 124 are part of a Late Successional Reserve, which is supposed to be set aside to provide old-growth habitat. Scott Greacen, national forest program coordinator with EPIC, says some of the world's most prominent forest scientists have gone on record opposing the so-called "salvage" logging of burned forests with important habitat values. "Among the submissions we asked the Forest Service to consider here were comments of Dr. Jerry Franklin outlining the serious ecological costs and consequences of treating a post-fire forest as a piggy bank to be raided." 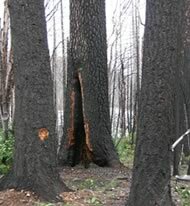 Greacen said both fire science and environmental law indicate that the Forest Service should not be able to conduct damaging salvage logging in a Late Successional Reserve. The sale area also includes 57 acres of designated Critical Habitat for the Northern Spotted Owl, as well as designated critical habitat for the marbled murrelet and nearby critical habitat for the coho salmon. All three species are listed as Threatened under the federal Endangered Species Act, now itself imperiled by radical House Republicans led by California Representative Richard Pombo (R-Tracy). One of the changes that anti-environmental congressmen are seeking to the Endangered Species Act is the elimination of critical habitat, a designation federal agencies have long resisted and which the Forest Service is attempting to ignore in this case. Under even the Bush Administration's much-weakened version of the regulations governing categorical exclusions, the presence of threatened or endangered species or their critical habitat is supposed to bar the use of the Categorical Exclusion that the Forest Service has relied on in this case. Conservationists charge that the federal agency is increasingly emphasizing logging projects at the expense of its responsibility to conserve fish and wildlife habitat in the public forests. George Sexton, conservation director for KS Wild, said the presence of so much key habitat, very steep slopes, and the nature of the burned forest in the old-growth reserve are all reasons the Forest Service could and should have decided that the Sims logging could not be done under a Categorial Exclusion. "There is a reason this area is designated as an old-growth RESERVE rather than an old-growth stump-field. And that reason is that these snags hold fragile soils in place, and provide critical wildlife habitat when the forest needs it most." Two separate cases have been filed in this case: one by the coalition of EPIC, KS Wild, and the Orleans-based Klamath Forest Alliance, and one by the Forest Service Employees for Environmental Ethics (FSEEE). All work together in northwestern California to protect and restore the Klamath-Siskiyou bioregion. The EPIC case is Civ 05-02227 WDB; the FSEEE case is Civ 05-02220 SI. Photographs of the proposed timber sale area and a copy of the court's preliminary injunction order are available by request.